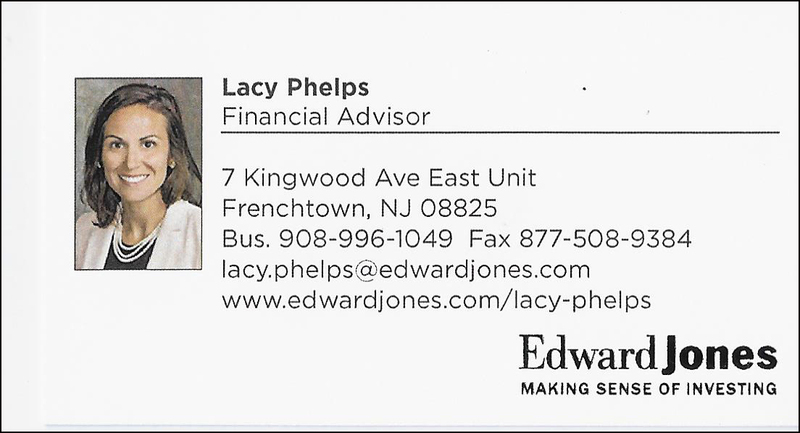 I am a forward-thinking, Hunterdon County based financial advisor that provides tailored solutions and attentive service to a select group of individuals, families, and businesses both locally and around the country. My mission is to become an essential partner to my clients by helping them define and achieve what is most important financially through a collaborative and educational approach. My commitment to this mission is defined by three core principles. I employ a personalized approach, through collaborative, in-depth conversations and recommendations that simplify complex issues. I use tailored solutions and an established process to build investment portfolios and manage risk appropriate for each client. I practice attentive service in all my affairs, exceeding client responsiveness and accessibility expectations, while maintaining personal relationships based on listening and understanding. Clients feel confident in knowing where they’re going, comfort in having an advisor acting in their best interest, and assurance collaborating in an environment of trust. In addition to educating the community on ways to prepare for their financial futures, I am an advocate for local arts, innovation, and leadership. My passion is to help others enjoy our local communities and everything we have to offer. I am a trainer for the Greater Flemington Soccer Club, a member of the United Way of Hunterdon County CRISP Committee, a member of Sustainable Frenchtown, and a board member of the Frenchtown Business and Professional Association. I am a neighborhood financial advisor, who brings a wealth of knowledge with an MBA in finance and over nine years of experience in the financial services industry. I work with businesses and individuals in an intimate, one-on-one environment with the support of thousands behind the scene. I have an established process to determine what’s important to my clients and partner for the long term to help them reach their financial goals. 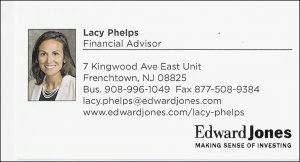 Edward Jones focuses on serving the needs of one client: the serious, long-term individual investor. Edward Jones serves nearly 7 million investors from more offices than any other investment firm in America. We attribute a great deal of our success to our principles and personal, long-term approach to investing. We have consistently been ranked among the best companies to work for by FORTUNE magazine, and our employees tend to stay with us for years. As a privately owned company, Edward Jones has a very personal feel that’s almost like family. And we’re very proud of that. Consider attending a BRN meeting as a guest. Take our proven process for lead generation out for a test drive!